US equity indexes closed significantly higher, sp +46pts (1.7%) at 2695 (range 2593/2701). The two leaders - Trans/R2K, settled +1.7% and +1.0% respectively. 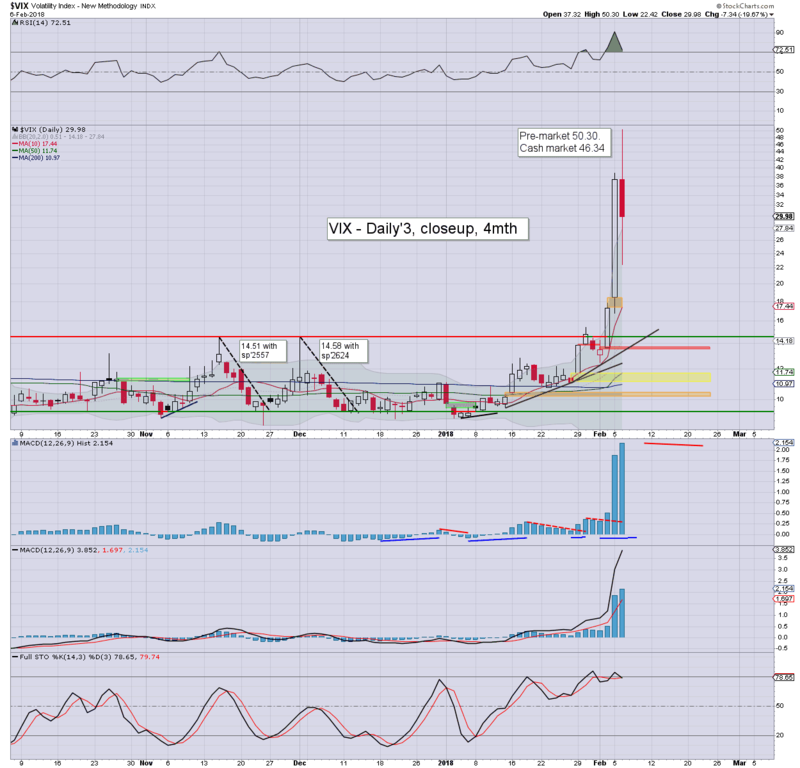 VIX settled -19.7% at 29.98. Near term outlook offers further swings, but broadly... another multi-month push upward is due to big target of 2950/3047. US equities experienced another wild day, opening sig' lower, but then seeing a powerful opening reversal from sp'2593, surging to 2682, before a great deal of chop that stretched into afternoon. The closing hour saw a new intra high of 2695. It was a truly INSANE day for volatility. 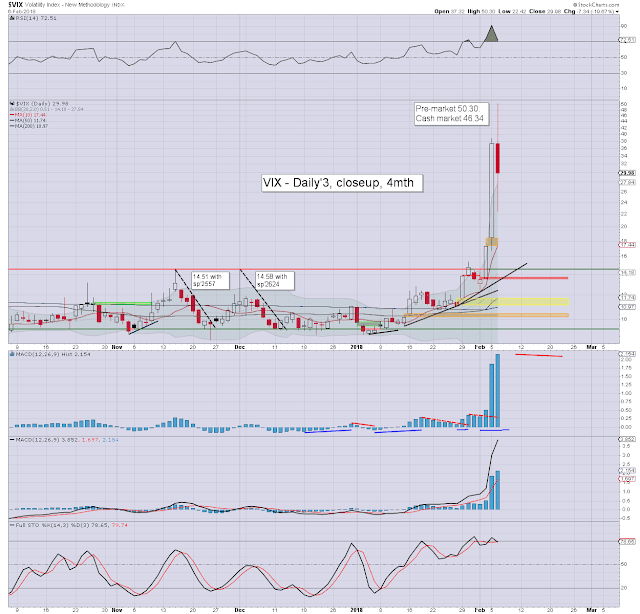 The VIX printed 50.30 in pre-market, opened in the 41s, collapsed to the 22s, then hyper ramped to an intra high of 46.34, before cooling into the afternoon, settling in the upper 29s. Q. 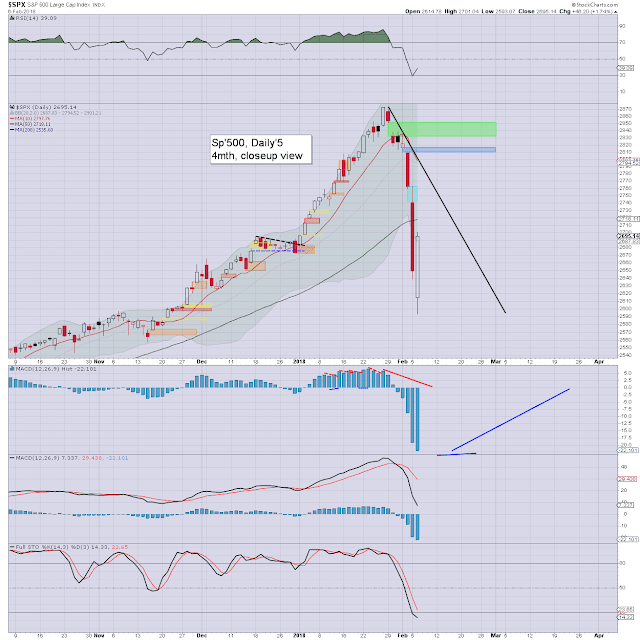 Do we have a key cycle low of 2593 from sp'2872? Difficult to say. Volatility remains very elevated, but if the bears can't achieve another swing lower within 2-3 days, then we have a secure floor. Even if we did break <2593, it'd likely only result in a marginal lower low, before still whipsawing upward. Big target for the late spring/early summer remains 2950/3047, which is where we'll get stuck. Considering recent price action/volatility, it has to be considered that a far bigger correction of 15/20% is viable this summer. Even that won't take out of range my year end target of 3245, that still looks good. Space X saw a successful launch of Falcon Heavy, carrying Elon's personal Tesla Roadster. Sunny... but with occasional snowflakes.